It was a gorgeous day for an outdoor ceremony the day Laura and Dave tied the knot overlooking the golf course at Brooklake Country Club in Florham Park, NJ. Laura looked simply stunning with her hair swept back in a flowered barrette and her strapless lace wedding gown. Her bridesmaids wore blue and carried white and orange bouquets designed by Connoly’s Florist. The Rhythm Shop kept everyone moving on the dance floor, while our photo booth created a buzz off the dance floor! Guests gathered in front of our white backdrop and posed for pictures with the bride & groom. Congratulations, Laura and Dave! We can’t wait to meet with you to help put your wedding album together. Sarah and Yechiel became “Mr. and Mrs.” on a beautiful December day at Temple Emanu-El in Closter, NJ. The happy couple were surrounded by all of their family and friends on this special day. Events by Karie helped tie all the beautiful details together from the chuppah and centerpiece florals, designed by Matthew Kollins at Atlas Floral Decorators, to the wedding cake and even the lighting. Neshoma Orchestras made the night memorable. 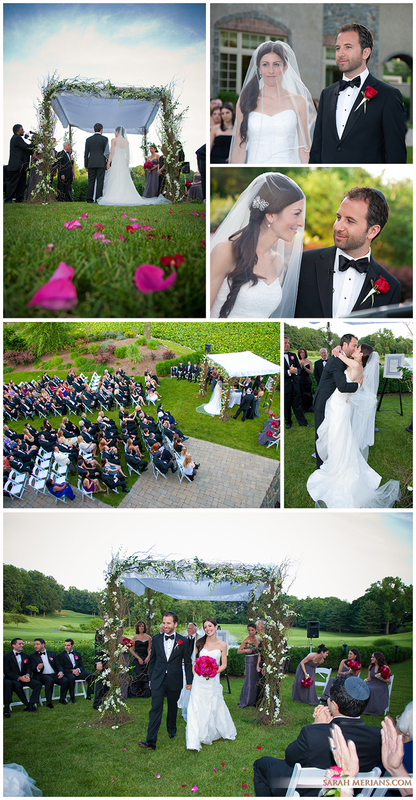 Take a look at Sarah and Yechiel’s wedding day story on video and in photos below. WEDDING WEDNESDAY: Jen, clad in a simple, yet incredibly elegant strapless wedding gown married the love-of-her-life, David, at Alpine Country Club in Demarest, NJ in front of family and friends. Their chuppah, designed by florist Wildflower overlooking the Alpine golf course, stood tall wrapped in flowers and branches. The bridesmaids and their red bouquets coordinated perfectly with the hot pink orchid table centerpieces. The bride, groom and their guests enjoyed singing and dancing along with the Faze 4 Soulplay band- who led everyone in a line dance mid-wedding. The anticipation on groom David’s face before catching a glimpse of his beautiful bride, Jen, was simply magical. It’s always so special being a part of the memories of our clients’ wedding day and witnessing the love between all our happy couples.